Met Jenko! He was found in MT Airy as a newcomer in a small managed colony. He's sweet and not meant for the outdoor life. He was found to be previously neutered so may have been dumped by his previous owners. He was filthy and beat up but with some TLC he is looking better and better every day. His ear is crinkled from a previous ear infection but nothing needs to be done with it and we think it adds some charm and cuteness to his personality. 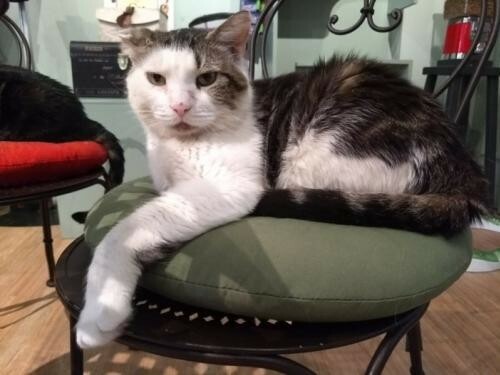 He would be best as a single kitty If you want to meet this sweet cat, please submit an application on our website: application. All our cats are up-to-date on vaccines and ready to go home. And if you can't adopt but would like to help, fostering is always an option! You can also schedule a play date and meet some of our affectionate rescues by visiting Le Cat Cafe. Schedule a visit today! Not what you were looking for? You can adopt a different pet in Philadelphia by using our search feature and adjusting the radius. Thank you for helping our animal shelters and rescue groups with pet adoption! Green Street Rescue (GSR) is an all volunteer non-profit whose goal is to humanely reduce the stray cat population in Philadelphia, through rescue work and adoptions and the practice of Trap-Neuter-Return-Manage (TNRM) for feral cats. We work in the city of Philadelphia and suburbs.